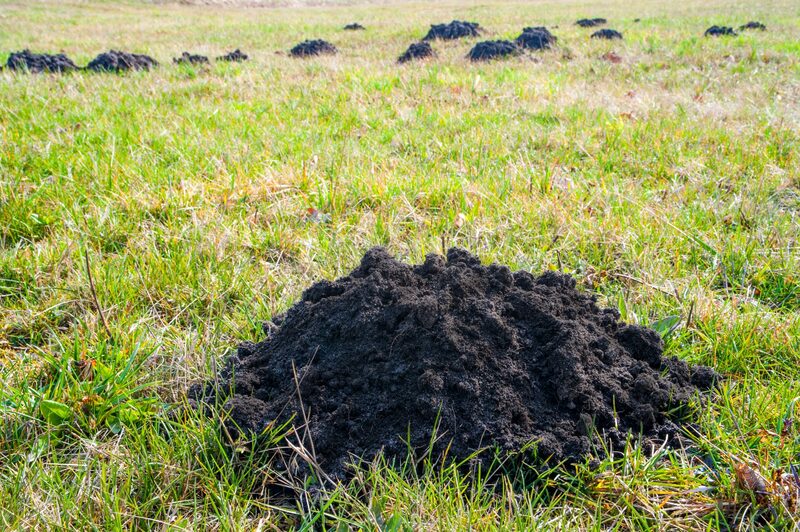 The first indication that a mole problem exists will possibly be the tell tale mounds of soil. These mounds of soil are created as the moles carry out the creating of their runways and tunnels. These large mounds are an indication of where the moles are living. Moles are small mammals which eat worms and mole nests are often to be found adjacent to hedgerows or fences. The diet of the mole consists primarily of earthworms and small invertebrates which are to be found in the soil. The problems associated with moles and their burrowing include killing to areas of lawn, undermining plant roots, damage to agricultural machinery by the exposure of stones, damage to plants when the mole disturbs the soil, the reduction of pasture due to the covering of the pasture with soil which reduces its yield and in additional damage to drainage systems. Mole catchers years ago were a part of country life in Britain and this was the case up until the middle of the 20th century. Some specialised operators still remain. Moles are extremely sensitive to unusual odours and therefore if control by the use of traps is to be successful then gloves should be worn when setting the traps. In addition, traps should be buried in the soil to ‘weather’ the metal prior to use. When a trapping programme is commenced firstly, the run has to be located, a section of turf is removed, a hole dug into the run to accommodate the trap. The trap will then be set in line with the run. The turf is replaced blocking any light from filtering into the run. Scissor traps will often be used as they have the advantage that when set the ends are visible. Therefore this type of trap is easily monitored.